With water restrictions now a reality in most areas, it has become more and more important for all of us to chip in and play our part in saving water. It may seem like a daunting task – but it doesn’t have to be so. There are practical day-to-day things that you can do to aid you in saving water and watching your water consumption. Here’s how you can start saving water today! Showering vs bathing: Choosing to take a shower rather than a bath means that you could save up to 400 litres of water a week. Keep in mind that this doesn’t mean you should have 25 minute showers – minimise the time you spend in it, especially if you live in a household with other people. A timer in the bathroom might help, as will turning off the water while you lather up, especially now the weather’s a little warmer. If you don’t have access to a shower or you simply prefer bathing, you can also save water – just plug the tub before running your bath and adjust the water temperature as the tub fills up – and don’t fill it to the top! Re-use. Recycle: There’s an overflow of recycling opportunities when it comes to water. Whether it be from washing machines, baths, from boiling foods and cleaning fruits/veggies – there is always grey water that can be reused. Your house plants aren’t picky with the water you give them (as long as it’s chemical-free), so use the water from boiling eggs, collect water with a bucket while you run the tap for hot water, or feed your plants the nutrient-rich water from your fish tank after cleaning it out. You can even take it a step further by not throwing fallen ice-cubes in the sink – popping the cube on your house plants will keep your plants cool and hydrated. Strategic gardening: What if you were told that giving your pets a scrub could be coupled up with watering your garden? 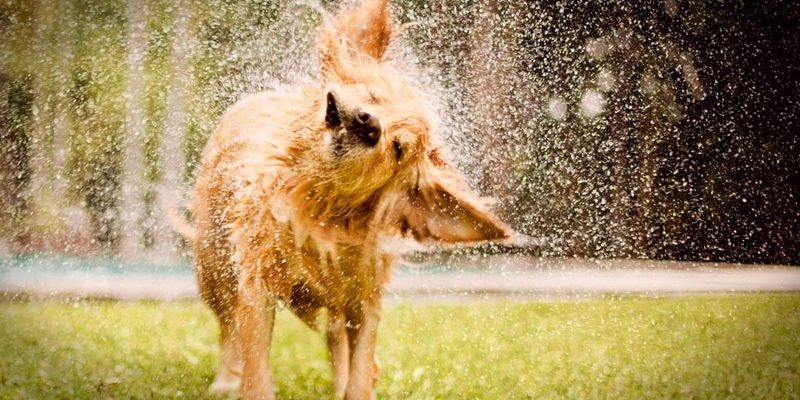 Wash your pets outside in an area of your lawn or garden that needs water – not only will you be reusing the water but their shake-off will act as a quick sprinkler too! Another important gardening tip (if it’s not already restricted by your municipality) to help you save water is to water your plants during the early morning hours or in the evening – the cooler temperatures help decrease evaporation. Grouping your plants according to their water needs and removing invasive alien plants will also help you save water as you water your garden. Did you know that washing your car on your lawn as opposed to the driveway pavement is another way to water your garden area? Don’t let the tap run! When washing your fruits and vegetables, or when lathering your hands to wash them, or when brushing your teeth and washing your hair – these are all instances where you can save water by not letting the tap run and only opening it when you need to or when you can use buckets/cups to control the usage. Also, why not keep water in a jug and avoid running the tap every time you drink – loads of water is wasted through overspill. Check for leaks: Early detection of leaks could save you water and money – this is why it’s important to know how to use your water meter to check for leaks and to also monitor your water bill for unexplainable high usage. Toilet leaks are a silent water waster, but you can nip it by regularly checking for leaks. While you’re at it, check all your taps too. Use your appliances wisely: When boiling the kettle, only boil what you will need – this way you will save on water and electricity. Match your water levels to your load size when doing the laundry. An important thing to remember, when shopping for appliances like dishwashers and washing machines, compare models and choose energy efficient ones as they will help save you litres of water with every use. Water-efficient dishwashing: Scrape the dishes rather than rinsing them off – this will save you water whether you’re washing them by hand or using a dishwasher. If you’re going to be rinsing dishes, rather fill up another basin or dish with water as opposed to rinsing under a running tap. When using a dishwasher, run it when it’s full – this way you save water and electricity by avoiding too many loads. There are many ways to save water, whether it be by reducing the number of times you flush and what you flush down your toilet or by covering your pool to prevent evaporation or using a broom instead of a hose to clean your patio and driveway/sidewalk – click here for more tips for saving water in your home. Effective water saving starts with you!